Check out the quick guide to the zodiacs to understand all the components of your sign. (this may make a lot more sense with the guide). Diamond is a symbol of purity & light, a stone that represents cleansing of the aura & allowing the soul to shine through. The light of the diamond shows negative emotions or thoughts that require transformation, helping with enlightenment and evolution. Magnetite represents positive/negative polarity, providing for balanced & objective perspective and strengthens intuition. Aquamarine is a stone of calming energy with an affinity to sensitive people, representing one’s understanding of underlying emotions, self-expression, closure, & perception. Selenite represents deep peace & clarity. Emerald helps bring to the surface what is unconsciously known. it is a stone of healing, wisdom, & equilibrium. Variscite is a stone of peace, courage, & trust in the universe serpentine is an earthing stone that helps with spiritual exploration & grounding. Tiger’s eye is a stone of high vibrational energy, helping to promote clarity for scattered emotions, desires, & intentions to make a coherent whole. Citrine enhances positive emotions & promotes development of positive energy toward oneself & others. Rutilated quartz represents protection from negative energy, energy support during emotional release & confrontation, & insights into oneself to reach the root of problems while facilitating positive change. White calcite represents a connection between emotions / intellect & promotes inspiration. Opal represents reflection & intensification of feelings, emotional expression, & cohesiveness of emotional energy. Moonstone is a stone of intuition & a reminder of nature’s cycles; it helps with emotional instability, healing, balance of energies, & synchronicity. 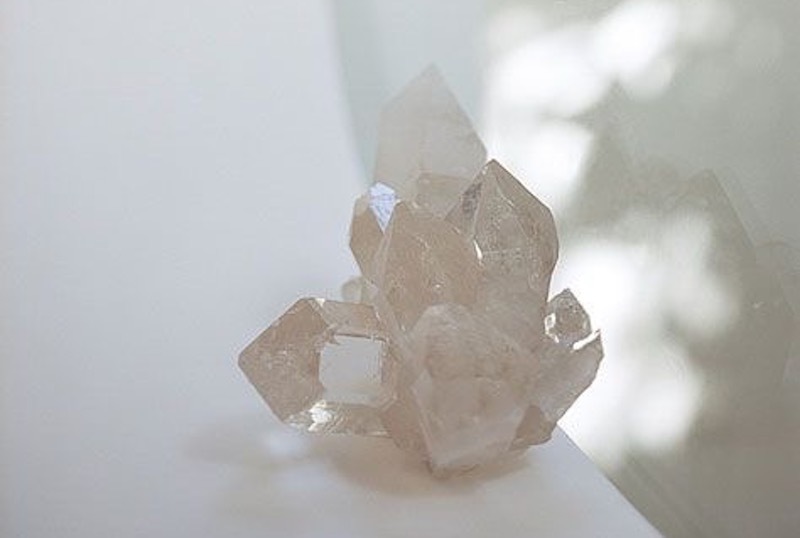 quartz is a stone of positive energy, spirituality, & balance of the chakras. Honey calcite is a gentle stone, representing balance of emotions, releasing of fear, strengthening one’s higher consciousness. it corresponds with the sacral chakra, which represents confidence & connection to oneself & the universe. Amber is a grounding stone representing positive & bright mental / emotional states, patience, & the throat chakra–encouraging vocalization, honesty, & expression of feelings. Peridot represents letting go of negative energies & old vibrations so higher frequencies can begin to guide oneself; it is a stone of necessary change, confidence and psychological clarity. Moss agate enables one to see the power in themselves & their emotions through releasing fear & stress. Prehnite is a stone for connecting with the universe’s energy & a crystal for healing through connecting to the higher self. Jade is a nurturing stone, bringing insight into oneself through calming energy & helping to express passionate emotions in constructive ways. Chrysoprase represents a sense of belonging in the universe, honesty & truth, letting go of the ego, openness to change, & independence. Blue topaz is a stone of personal truth & wisdom. Dioptase represents consciousness in the present moment, releasing the need to control & helping the process of healing. it teaches that pain & difficulty in life is a mirroring of an inner separation from the self. Obsidian vitalizes the purpose of the soul, grounding the spirit into the body & exploring the depths of the subconscious mind/ emotions. Gold obsidian helps with conflicts of the ego. Okenite clears obstacles in one’s path, promoting endurance to complete tasks / reach goals. it represents self-forgiveness for mistakes & the cyclical nature of learning. Smoky quartz relieves negative energy, helps to tolerate difficult times with equanimity, & gently releases fear within oneself. Onyx represents strength-giving & vigor. Magnetite represents positive / negative polarity, providing for balanced & objective perspective and strengthens intuition. White aragonite represents the earth. it helps develop concentration, flexibility, & tolerance to the mind while combating sensitivity or stress. Blue obsidian vitalizes the soul & the self; it represents the throat chakra, supporting communication. Boji stone represents feminine energy & awareness of self through clearing blocked or painful emotions & revealing negative thoughts / self-defeating behaviors to the conscious mind. Blue agate brings peace of mind, effective in healing the throat chakra–free expression of thoughts & feelings. Labradorite is a bringer of light & mysticism, stimulating intuition & trust in the universe. it balances rationality & emotions by inspiring contemplation & introspection of the self. Amethyst represents calming protection & higher vibrations of spiritual consciousness. Want to learn more about crystals? The Crystal Bible is an awesome book that gives you healing properties, applications, spiritual and psychological effects of every crystal.